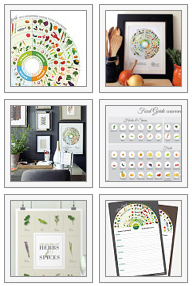 Jessica Haas Design’s newest product the Vitamin Food Guide is due to officially release in February. There’s just one last thing needed… YOUR VOTE! Okay, so here’s a little back story. While researching vitamin guides, I didn’t really find a chart that was right for everyone. What I mean by that is, most charts selected one or two foods for each vitamin, for example, for Vitamin B5 eat eggs. What if you have an egg allergy? What if you were a vegan? What if you simply dislike the taste of eggs? Introducing the JHD Vitamin Food Guide; flexible to varying dietary needs, allergies, and most importantly individual tastes. Just like the JHD Local Seasonal Food Guides, each vitamin is divided into herbs, grains, fruit, protein, and vegetables. This makes not only the information easy understand but easy for anyone to intake vitamins without changing their eating habits. So now after hours of research, data collection, and designing, there’s just one last decision to be made, the color palette. I’ve narrowed my designs down to two color options, shown above, and I’d like to get your feedback. Is it the rainbow color palette where each vitamin has its own color? Or the harmonious, calm blue/gray color palette? Cast your vote below. If you are interested in purchasing this Vitamin Food Guide, both color options are available for pre-order for a limited time on Etsy. Once the votes are in, JHD will only have the winning design for sell. Polling ends February 4th, 2018 so vote now! SEE the results here Tuesday, Feb. 6th. This entry was posted in Advertising, Appreciation, Educate, february, foods, Graphic Design, Illustration, Infographic, Jessica Haas Designs' Work, Opportunity and tagged B5 B12, best vitamin chart, best vitamin guide, daily vitamins, Dr. Oz vitamins, eat your vitamins, food category, fruits and vitamins, healing power of vitamins, health wheels, how to eat your vitamins, jessica haas designs, simple cheat sheet, vitamin A, vitamin B, Vitamin B3, Vitamin C foods, vitamin chart, vitamin cheat sheet, Vitamin D foods, vitamin food guide, vitamin infographic, Vitamin K, vitamin mineral guide, vitamin reference, Vote for your favorite color, what foods to eat for vitamins, what fruits to eat for vitamin, what to eat for vitamins, what vegetables to eat for vitamins. Bookmark the permalink.